“They don’t think we have the balls to do this” declares Viola Davis (Veronica) through gritted teeth and with clenched fist, there is the briefest of pauses in this moment. A pause to let that line breathe and a pause to let that exclamation sink in. This is not a throw away line of dialogue but a statement of intent and rallying call to all who have not yet believed. Steve McQueen is a director of great artistic merit, an Oscar winner and many lines of praise have been written by a plethora of critics for his artistic direction, his bold choices in subject matter and the manner in which he handles them. It may therefore be little surprising that he has chosen to adapt (with the helpful pen of Gillian Flynn) a 1980s TV mini crime drama. Set in contemporary Chicago, four women find themselves widowed by their dead husbands' criminal activities, thrust together having never met and with nothing in common (except a debt left behind) they take fate into their own hands and plot to pull a heist that will pay their differing debts and forge a future on their own terms. At the head of this plot is Veronica (Viola Davis) who finds herself stepping out from the shadow of her well known gangster husband (Liam Neeson) to take charge of this newly formed group. Armed with only her wits and a notebook of information, contacts and plots behind for her she forms an initially, uneasy alliance with Michelle Rodrigues (Linda) and Elizabeth Debicki (Alice) and concocts a plot to steal from the reluctant political animal of Colin Farrell (Jack Mulligan). Mulligan claims to have the poor districts of Chicago’s best interests at heart, but in reality is happily sitting on a glut of cash and family legacy to maintain governmental power and control of the era. 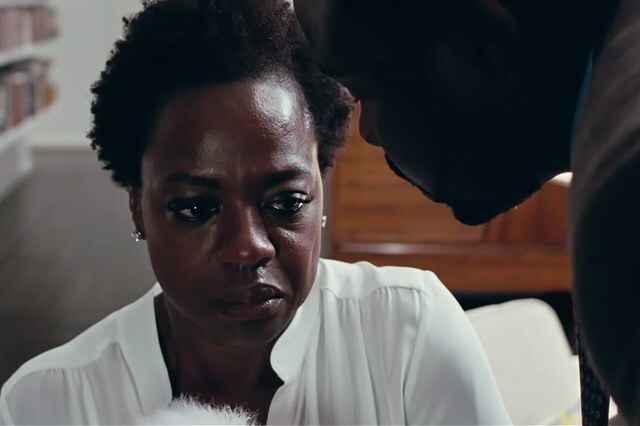 Lurking In the background is a genuine threat as Veronica is being hounded by Jamal Manning and his brother (played with wonderful silent menace by Daniel Kaluuya), seeking reparations for crimes committed by her husband. The clock is ticking, the tension is rising and this plan has to work! This all sounds like a basic thriller heist, and there is a popcorn munching plot in play. However, this is a Steve McQueen film, once you scratch the surface you quickly discover layers of detail that others would ignore. McQueen and his cast tackle issues of race, take swipes at politics, ask the audience to consider if the criminals or indeed the politicians are the real gangsters, cast an eye on the church and its influence being available to the highest bidder and also asks questions fun availability in Chicago and America as a whole. Chief among all threads of thought however is the true purpose of the film - the power of women. This film preaches and praises the benefits of their coming together in adversity, the ability to overcome obstacles and their desire to succeed. These women are all powerful, all have their unique talents and are all given time and character development to have every audience member believe in them. Viola Davis is a true powerhouse from minute one, switching seamlessly between cold and calculated in public, to emotional and grief stricken in private, she deserves the highest recognition and plaudits for this incredible performance when award season rolls around. This is much more than a heist movie. This is political, societal commentary in a story that glides with ease into popcorn feasting action. If you don’t believe that they could have the balls to pull all that off, go see Widows and tell me otherwise! Widows in on general release in cinemas now.